The Grounds of Alexandria is undoubtedly one of the most picturesque brunch spots in the city. Whether you’re salivating over the doughnuts and lemonades at the weekend markets or snapping pics of the vibrant flowers, you’re sure to get an Insta that will be the envy of all your friends! Located in the heart of the city, the University of Sydney is home to classic stone buildings, rolling green lawns, and picturesque views of the CBD. Try snapping a shot in the middle of the quad of the beautiful sandstone buildings and manicured lawns that will have everyone double-tapping! This is one of Sydney’s most iconic and popular tourist destinations. Located on the edge of Royal Botanic Gardens, this exposed sandstone bench offers incredible views of the Opera House and Harbour Bridge. Get there early to avoid the crowds and make the most of the morning light! This beautiful walk is full of so many Instagrammable views that it’ll give you TBT posts for months to come! From classic shots of the many beaches to striking ocean cliffs to the iconic Bondi Icebergs pool, you can’t go wrong! This is one of Sydney’s most iconic buildings and for good reason. Snap a pic at high tea or just enjoy the beautiful architecture – either way, Queen Victoria Building is a sure-fire way to up your Instagram game! Take a walk along the iconic Harbour Bridge for beautiful views of Luna Park, the Opera House, and the harbour. Save yourself $100 and head up Pylon Lookout instead of doing the BridgeClimb – the views are just as spectacular and you don’t have to put on a blue jumpsuit. Located about an hour’s drive from central Sydney, Royal National Park is worth the trip. With everything from stunning mountains to beaches to the ever-popular Figure 8 Pool, you’re guaranteed to get some Insta-worthy pics! While in Royal National Park, Wedding Cake Rock deserves its own spot on this list. True to its name, the pristine white rock against the impossibly blue backdrop of the South Pacific Ocean will be a welcome addition to your followers’ Instagram feeds! Hop on a train north of the harbour to experience the serene beauty of Lavender Bay. The true gem of the area is Wendy Whiteley’s Secret Garden overflowing with beautiful plants, picturesque walkways, and stunning views of the Harbour Bridge. This eastern suburb is straight out of Instagram paradise with palm trees, peaceful beaches, and gorgeous harbour views. Pro tip: stay for the sunset to get a gorgeous shot of the Sydney skyline illuminated in red and orange hues. Location in central Sydney, Observatory Hill offers panoramic views of the harbour from the comfort of a gazebo. Relax on the grassy lawn, enjoy the artwork in the park, and snap some stunning pics that will make all of your friends jealous. Perhaps one of the most recognizable locations in Sydney, Luna Park is a prime Insta location, from the iconic entrance to classic shots of the Ferris wheel against a clear blue sky. After snapping a pic, jump on some rides and have some fun! Who said you can’t have your cake and eat it too? Located under the Harbour Bridge, you’d be hard-pressed to find a more convenient and photogenic pool in the city. Post a pic during January or February to remind all of your friends in the northern hemisphere that you’re living it up in the Australian summer heat. The former railway building is beautiful itself, but it’s the events that truly make this spot an Instagrammer’s heaven! Choose from the lively Saturday farmers’ markets, live music events, exhibitions, and more for the perfect photo op. Last but not least, Bare Island offers incredible waterfront views over La Perouse. Go to the publicly accessible footbridge at sunrise for a pic that’ll make everyone want to start planning their next trip to Sydney! 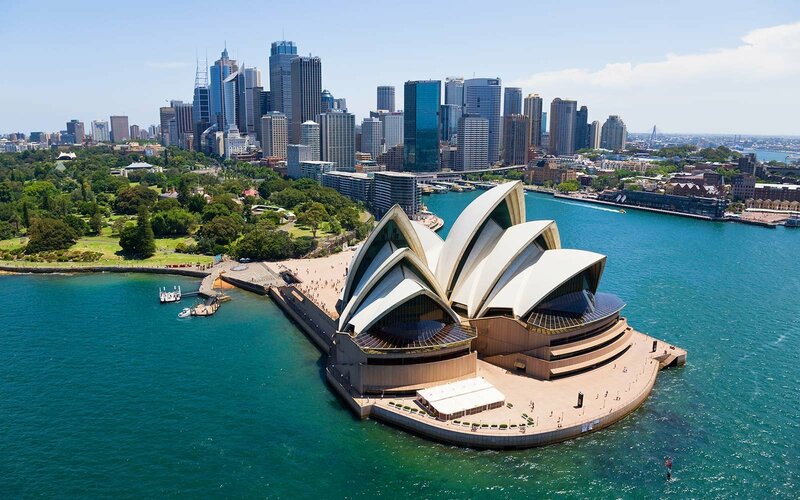 Ready to start your adventure in Sydney? Check out our Oz trips here!